The rain spluttered between pelting and curiously cooling. We descended down an off ramp, cars honking at our wet madness, ever vigilant on the loose gravel (would we lose it, would we hit another patch of glass), only a few more kilometers to Swansea and a dry motel room with a hot shower. Mike MacDonald, ride leader and organiser, called out the word we dreaded and expected: “puncture”. The third time in only an hour, this time it was Mike’s turn. Craig, myself, Mike and Ivor had participated in the last repair, and three of us previously for Nan’s bike just out of The Entrance. Craig and I had the ‘upbeat’ patter ready. “The executive committee meets again,” said Craig. “Shall I read the minutes from the previous?” I asked. “You blokes standing around can give me a hand,” growled Mike. We were having none of it. “Don’t you have those tyres that never puncture,” I asked. “They’re pretty good, Schwalbes,” said Mike. I ran the wheel slowly looking for the glass, metal or cut that could have caused the problem. If you don’t remove it, you’ll just get another puncture. A half turn of the wheel showed the brown shard of glass stuck in the tyre. Nothing could prevent that nasty piece causing a puncture. “Going to keep that brown diamond?” asked Ivor. We knew before we started we were in for tough conditions, the forecast was uncompromising. Rain, heavy rain, chance of storms, gale force winds. The original nineteen had whittled itself down to 12. Even riding to the station in the early morning dark there was a heavy shower. “Ding, ding,” went the phone, a message that another compadre had chosen the easy path. 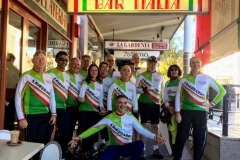 As we regrouped at Tuggerah station for the ride start, it was time to choose between plan A and plan B; continue the ride as planned, or take another train up to Cockle Creek and do a shortened ride to Swansea. There was an unstated plan C, take the train to Newcastle, have coffee and lunch and go home. At Tuggerah the rain wasn’t too bad, so we simply set off. Some people wrapped up with long sleeves and leggings, shoe coverings and rain coats. I took a different approach, I knew I was going to get wet. I had open sandals, knicks and cycling shirt. Everything else was in my one pannier in plastic bags. Non-cycling clothes for tonight and a dry set for tomorrow. 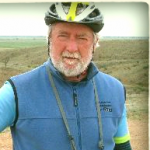 We were joined on the ride by Mick Saunder’s Irish mate, also called Mick. Ivor, Rob, Anne, Craig, myself and Nan, Bruce and Grant, Philip and our ride leader Mike. The next day a friend of Anne, also called Anne, and another Irish friend of Mick’s joined us. As we cycled along the coastal path between Tuggerah and The Entrance, the wind and rain variously struck at us, but nothing too serious. It was really pleasant riding. The creeks and waterways feeding the lake seemed to come alive with frog noises, Bell bird calls, and on the lake, leaping kite surfers. It’s funny, but one of the more annoying aspects of the weekend was the coffee shop at the Entrance, not the rain, wind, punctures. The less said about it the better. We took off in strong wind across the bridge at the Entrance, the shared footpath was downwind, so the road was not a “lee road.” As it was, several of us struggled to maintain a straight crossing. The way to Budgewoi has seen a lot of the path extended, but much was on the cycling was on the verge of a busy road. These verges are not my favorite places, the ever present danger of potholes, loose gravel, glass and cars travelling at high speed sometimes less than a metre away. Budgewoi was sit down lunch at the Saltwater Seafood restaurant. It was pleasant to hunker down out of the rain. Mick and Mick kept up an amusing Irish banter. We tried to linger till a break in the rain. Alas, it just seemed to keep up. Budgewoi to Swansea involved a lot of verge cycling again. There was the option to go to Catherine Hill with a visit to the pub. It would have involved a little bit more of a hill climb, but less traffic. As it was, we all opted to go straight to Swansea. That’s when the punctures hit us. Dry in our rooms in Swansea, we could rest. Mike arranged the courtesy bus from the RSL to pick us up. Even though it was less than a hundred metres away, we were all glad he did. The rain came in buckets. We sat eating our meal overlooking the Swansea bridge, the wind howling, the rain lashing, the sea water whipping the bridge pylons. Despite these somber images our spirits were good, with much good humoured banter and discussion. It’s funny how the shared purpose of the ride overcomes the natural reluctance to engage one another. People you might not have had much in common with, might not have had much shared background or cared much about, become very important for that brief period. You are very dependent on each other, and this creates an engaging bond. That night, lightning lit the sky up. The forecast was positive, but what would the morning really be like? It turned out a beautiful day, sunny, a bit humid but a mild breeze. We rode out to the Belmont/Swansea beach, the surf was boiling, the beach was closed. A group photo at the start of the Fernliegh rail trail, and we were off. This is a stunning ride. Because of the rain the day before, all the creeks and swamps this trail snakes through were full. And speaking of snakes, Nan and Craig had a close encounter with a black snake crossing the path. Before too long we were in Newcastle. We said goodbye to our three Irish amigos, and headed to a Darby St cafe. Coffee, cakes, and in some cases, substantial meals, before catching the 12:35 back to Sydney. Many thanks to our ride leader and organiser, Mike MacDonald and to our fellow compadres for a very exciting and enjoyable weekend. The indomitables do it again! I almost can’t believe you made it. Very glad it went well. Retain the Old Glebe Island Bridge- a victory? 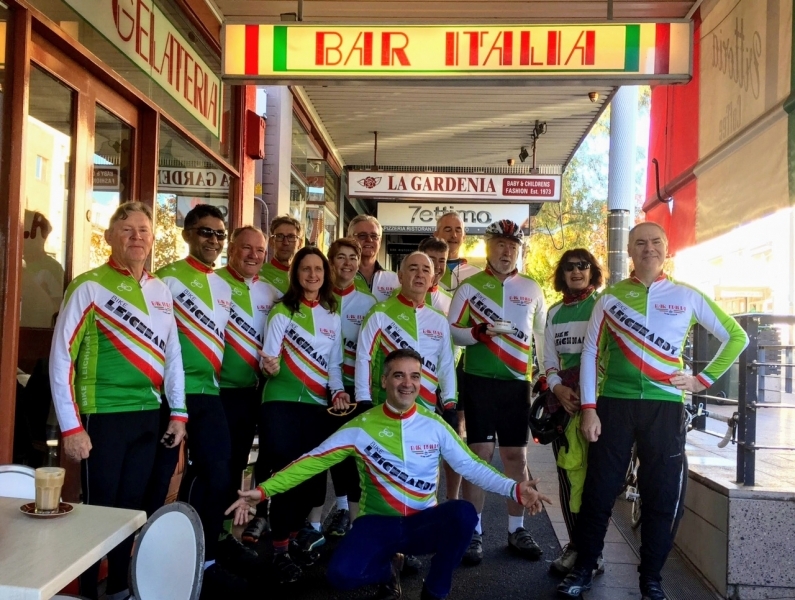 Copyright © 2019 Bike Leichhardt. Powered by WordPress. Theme: Spacious by ThemeGrill.